A few months back, I played around with (yet again) rebuilding a half-finished Metroidvania-style game I’ve played around with off and on over the years. If it’s not immediately obvious, that’s essentially a vertical menu with items that have horizontal behaviors. 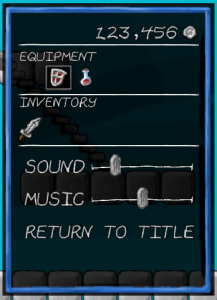 When “Equipment” is selected, you can choose an item to use or equip on the horizontal axis. When a volume slider is selected, you can adjust the value with the horizontal axis. Importantly, the game’s intended to be played with a gamepad, so I didn’t want the presence or absence of mouse or touch input to affect this behavior. I’ve been readying my demos for the Knox Game Design booth at the Knoxville Gaming Convention, which includes setting up some new demo tablets. Having used a Kindle Fire for demos a before, I feel like it’s a fairly reliable setup for anyone who develops Android games, so I thought I’d share it. The goal here is to have a device specifically for demos. I’d rather not put my personal tablet or phone, which is linked to my Google Play or Amazon Appstore accounts, up for public access. I have an Intel Compute Stick (which runs $100-$200) that I can use to run full-fledged PC demos. It’s nice and flexible, but it means I have to carry around a TV for each demo station I want to run. They’re cheap if you’re patient. If you watch Amazon.com deals and Woot.com (under Computers > Tablets), you can occasionally find good deals on older 6″ or 7″ Kindle models. For your average hobbyist developer, you don’t need anything fancier than that. I’ve bought a couple for $20-$30. They’re fairly reliable. Given how fragmented Android is, I’m not inclined to trust the performance of off-brand tablets for games, so getting a name-brand tablet (especially a name brand that’s essentially building its own platform) seems like a safe bet to me. For Kindle Fire, this means anything 2013 or later. If you want to be sure, there’s a list of versions and their corresponding devices on the Wikipedia page for Fire OS. If you’ve bought a tablet, you know how this goes. Your first startup is a tour of all the basic questions like language and wifi access, usually culminating in the option to login. The key point here is to skip registering an account. You should have the option to do this during the process (for some models, you may have to go back to the previous step to do so), and the tablet should still work if you do. If you bought a Kindle off of Amazon, the device may come pre-registered. You should find an option in Settings > Account to de-register the device. You don’t have to put your game on the Amazon Appstore to install it on your device; you can copy over the APK and install it from a file manager. Connect the tablet to your PC with a USB cable, and copy over the *.apk file to the file system. Open the APK and choose to install the application. If you get a “parse error” when you open the APK, go back and compare the tablet’s Android version to the minimum Android API level you selected in Unity. Physically mirroring your tablet to a TV is easy, but it requires some extra equipment you probably don’t have laying around. The Kindle Fires I have use either SlimPort enabled USB (newer?) or micro-HDMI (older). In the case of the USB, you can buy an adapter that will allow you to connect to both a HDMI cable (for mirroring) and a USB-B cable (for charging). This is the model I bought. In the case of micro-HDMI, you’ll have a micro-HDMI port alongside your USB. (The HDMI port will be the wider of the two.) In this case, all you need is a micro-HDMI to HDMI cable. While converting some old 2D Toolkit-based Unity code to plain vanilla Unity recently, I ran into a conundrum: Unity’s got great support for standard font formats, but still isn’t quite up to par with tk2d’s support for building fonts from spritesheets. It’s a minor issue–after all, it’s easier and more legible to drop in an existing font–but I wanted to keep the hand-drawn look. So, I fell down the rabbit hole of cataloging the different options Unity provides for UI text (including TextMesh Pro, recently acquired by Unity and built in to 2018.1). While my knowledge of typography is pretty shallow (and it seems to be a rather complex topic), this should give you an idea of what’s out there and why you might want to use it.